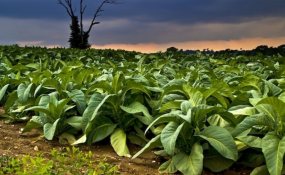 The Human Rights Watch (HRW) has called on the Zimbabwean government to protect tobacco farmers and their families from abusive practices and child labour. HRW, ahead of the launch of its report on the malpractices, said tobacco growing families were vulnerable to nicotine poisoning and abuse despite them being major stakeholders in the production of the country's top foreign currency earner. "Zimbabwe is one of the top tobacco producers in the world; tobacco is the country's number one export commodity," said HRW in a statement last week. "Its production, however, is fraught with abusive practices such as hazardous child labor and the exposure of insufficiently informed tobacco farmers and workers to nicotine poisoning, a new Human Rights Watch report found. "Our research revealed an industry fuelled by impoverished small-scale farmers and vulnerable workers--including young child workers--who need greater protection from Zimbabwean authorities and tobacco companies. "Adults and kids who were interviewed for this report all reported symptoms consistent with nicotine poisoning such as nausea, vomiting, headaches and dizziness. Almost no one we spoke to even knew what nicotine poisoning was, however." The report, authored by HRW researcher in the Children's Rights Division, Margaret Wurth, will be launched in Harare on Thursday, April 5. The international rights body claims labour rights violations were also common on commercial tobacco farms. "The report also found evidence of excessive working hours without overtime compensation on large-scale farms, and problems with wages, including having their wages withheld or delayed, and or being paid less than they were owed. Some of these farms supply big UK tobacco companies, among them BAT and Imperial," the statement read. The tobacco marketing season will be launched this Wednesday and the Tobacco Industry and Marketing Board has revealed that it is expecting the sale of at least 200 million kilograms. Last year, the board revealed it sold about $550 million worth of tobacco.